There are days when even the routine task of getting out of bed seems as daunting as an Everest expedition. You struggle through work, drinking copious amounts of coffee but still feeling like every inch of your being is crumbling. The day ends with you skipping gym and eventually passing out on your couch. We’ve all been there. This is what the average human being describes as a “lack of stamina”. There are many reasons for this condition. The more common reasons are poor dietary and sleeping habits, increased alcohol and caffeine intake, smoking, lack of exercise, grief and mental stress. Some more serious causes of fatigue and lack of stamina in some people may also be an overactive or an underactive thyroid, obesity, diabetes, physical deficiencies and hormonal imbalance. If a person feels exhausted quite often, especially without any physical exertion, then that is a cause for worry and he/she must consult a doctor. Meanwhile, there are numerous home remedies to battle lethargy and increase stamina. Bananas are packed with vitamins, fibers, and an abundant amount of magnesium. According to the U.S. Department of Agriculture, one medium banana contains around 32 milligrams of magnesium. Magnesium helps build strong immunity, supports a healthy heart, is anti-inflammatory and is responsible for releasing high doses of energy in the body. Bananas also convert sugar into instant energy. One must incorporate this nutritious fruit in their regular breakfast routine to affect increased energy levels throughout the day. Take two bananas and peel them. Add 1/3 cup of yoghurt, 1/3 cup of almonds, and ½ a cup of cooked oatmeal. Add two cups of ice (pour the ice at the top). Blend for 30 seconds or until a rich consistency is achieved. Take two whole-grain rye bread slices (or any healthy alternative of your choice). Spread almond butter on bread slices. The almond butter is rich in protein and mono-saturated fats. Take two bananas, peel them, and slime them into round pieces. The bananas also contain resistant starch (helps boost metabolism), as does the rye bread. Spread these pieces on the toast and enjoy! Blood sugar tends to drop when you do not eat anything for several hours and causes fatigue. Plain and unsalted almonds balance blood sugar levels and keep you energized throughout the day. They are also a perfect combination of proteins and healthy fats. Almonds are also rich in copper and manganese. Both of these are responsible for creating an oxidative enzyme that fights energy-obstructing free radicals in the mitochondria (our body’s energy reserve), hence, ensuring an unbridled flow on energy in our bodies. Almonds also contain riboflavin that clings to the protein enzymes in our bodies that allow creation of energy from oxygen. Take 1/2 a cup of water and put a handful of almonds in it. Cover with lid and leave them soaking for 8 hours. Drain out the water and peel of the skin. Store in a jar and consume regularly. It is advisable to consume soaked almonds as the skin of the almond contains tannin that obstructs the absorption of nutrients. Take 2 almonds, some dry raisins and a fig. Remove the contents from the water in the morning and drink the water. Peel and eat the almonds. Follow by consuming figs and raisins. According to a research study conducted in Japan by the Biological Sciences Laboratories of the Kao Corporation (which produces green tea drinks and beverages), the swimming performance and energy levels of mice increased by a considerable 24% over ten weeks. According to Kao Corporation, a person who weighs 165 pounds would reap similar benefits if they drank four cups for green tea in a day. However, “The International Journal for Vitamin and Nutrition Research” produced contrary results. According to a study conducted in Zurich, endurance cycling athletes displayed no improvement in performance or energy levels after being fed green tea for three weeks. While these studies might be baffling, green tea has different effects on different people. Take one cup of pure water. Add 1 tablespoon of organic honey and 2 tablespoons of Matcha powder. Pour the juice of one lime. Stir, drink, and feel energized instantly. The oil in coconut is rich in medium-chain triglycerides (saturated fats), often abbreviated to MCT. They get absorbed easily and are quickly converted into energy instead of being stored. Furthermore, these fats propel thermo-genesis (burning of fat) in the body. You may consume regular coconut oil. The alternative is coconut-extracted MCT supplements. In place of butter, spread coconut oil on warm toast. Sprinkle some cinnamon on top and enjoy. Add some coconut oil to your smoothies for an instant energy kick and appetite fix. Add some extra whey protein to build muscles and burn fat. One of the magical properties of whole grain is its ability to release glucose slowly into our bloodstream, thereby maintaining consistent levels of energy. Furthermore, unlike processed refined grains, whole grains have not been ripped off their nutrients, enzymes, vitamins and fibers. Whole grains such as Quinoa have incredible benefits and nutritional value. It packs in plenty of protein, fibers, magnesium, copper, folate, manganese and phosphorous. Apart from being a complete protein (containing all nine amino acids), it also contains antioxidants which help protect the mitochondria (energy reserve of the human body) from energy-sucking free radicals. Other energy producing whole grains include barley, buckwheat, bulgur, millets, and rolled oats. Take a non-stick skillet and put it over medium heat. Take 1 cup of washed and drained millets, and add to the skillet. Cook for about 10 minutes, stirring continuously, until nicely roasted. Add 4 cups of water to it, ½ a teaspoon of salt, and bring to a boil. Simmer for 20 minutes until the water is nearly absorbed. Take 4 cups of corn kernels and add it to the recipe. Cook it for 5 minutes and cover it for another 5 minutes. Remove from heat, take the mixture out of the skillet, and put to cool at room temperature. Once it cools down, add 4 cups of tomatoes (diced) and 1 avocado (peeled and diced). Add another ½ a teaspoon of salt, 1/3 cup of limejuice, 1/3 cup of chopped cilantro, 1 and a 1/2 teaspoons of ground cumin, 3 to 4 seeded and thinly chopped jalapeño peppers and 2 tablespoons of finely chopped green onions. Finish off by drizzling one 1 tablespoon of extra-virgin olive oil on top. According to a study by the National Institute of Health, athletes who took an Omega 3 Chia drink reported higher endurance and performance levels in a competition lasting less than 90 minutes. Moreover, this drink allowed them to consume more Omega 3 fatty acids and far less sugar than they would have consumed has they been consuming sports drinks. Chia seeds are high in dietary fibre, essential Omega-3 fats, protein and minerals and vitamins including potassium, iron and magnesium – all of which are highly rich sources of energy. It also contains Quercetin – an antioxidant also found in some sports drinks and known for boosting energy. According to famous dietician nutritionists Tammy Lakatos Shames & Lyssie Lakatos, chia seeds are the perfect food to fight fatigue. Take ¼ cup of chia seeds, 1 cup of coconut milk, and ½ a tablespoon of honey. Mix it all in a bowl, glass, or jar and pop it in the fridge overnight. Take it out the next morning, making sure the consistency of the milk is thick. Top it with nuts, fruits, or both, and enjoy. The practice of aromatherapy originated in Europe in the 1900s and since has become popular the world over. Essential oils are extracted from the flowers leaves, bark, stalk, root or rind and mixed with lotion, oil, or alcohol. They are then applied on the skin, used for body massage, added to bath water, or sprayed in the air. Aromatherapy practitioners note that the distinctive fragrances of these oils have a different effect on the body. When these smells interact with the nerves in the nose, these nerves send certain impulses to the brain. We are simultaneously relaxed and energized by this interaction as it releases stress. Add 3-6 drops of lemon or eucalyptus essential oil into a bowl of steaming, hot water. Put your face over the bowl top and cover your head with a towel in a way that no steam escapes. Close your eyes and let the steam work its magic, relax your face and clam your nerves. Fill the bathtub with water that is close to your body temperature or a little above it. Add anywhere between 12 to 16 drops of either peppermint, rosemary, grapefruit or ginger oils or a combination of them (these essential oils are especially known to combat fatigue and have an energizing effect). Soak in for as long as you want and finish with moisturizing your body while still damp to retain the moisture. According to the American Medical Student Association, the Bellows Breathing Exercise and the Diaphragmatic Breathing Exercise are sure-shot ways to pump up those energy levels and fight anxiety, stress and exhaustion. Incorporating these simple exercises into your daily routine will have a dramatic and long-lasting impact on not just your physical, but also your mental health. Rest your hands in your lap and sit comfortably in a chair. Arch your back, aligning your head and your neck with your back. With your mouth closed, start breathing through your nose rapidly. Continue for 15 seconds, take a break, and continue again after a while. You can increase the duration of the exercise as you become better accustomed to it. Relax your muscles and lie down in a comfortable position. Resting your hands on your abdomen, take deep breaths through your nose for 2 seconds. Follow by breathing our slowly through your nose for 4 seconds. Continue doing this exercise for 10 minutes. You can do this exercise 2-3 times a day. 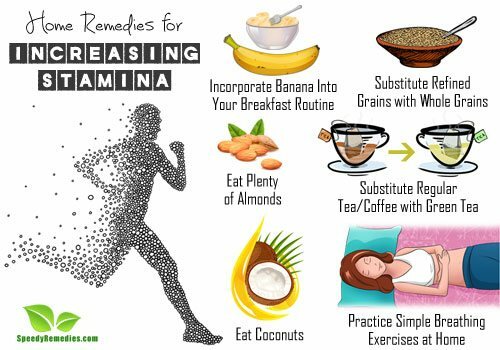 Journal of Strength and Conditioning Research: Omega 3 Chia seed loading as a means of carbohydrate loading.